Movistar Yamaha MotoGP duo Valentino Rossi and Maverick Viñales are aiming to challenge for a podium finish at this weekend’s Gran Premio Movistar de Aragon, with Yamaha’s last podium coming at the German GP when both riders stood on the rostrum behind race winner Marc Marquez (Repsol Honda Team). A repeat of the P2 finish for Rossi at the Sachsenring will be a boost for the ‘The Doctor’ after the disappointment of race day at his home GP in Misano. However, MotorLand Aragon isn’t a circuit that is particularly favourable with the nine-time World Champion, despite picking up three podium finishes at Aragon since it joined the calendar in 2010. Likewise, teammate Viñales currently has three podiums to his name at Aragon, but the Spaniard has never stood on the rostrum in the premier class at the circuit - something he’s aiming to change at a circuit he enjoys. “I'm very happy to head to Aragon. For me all the Spanish rounds are very special, because of the atmosphere and the fans that are always there supporting the Spanish rider. It‘s like my second home Grand Prix and we know that we can deliver a good performance there with the M1. 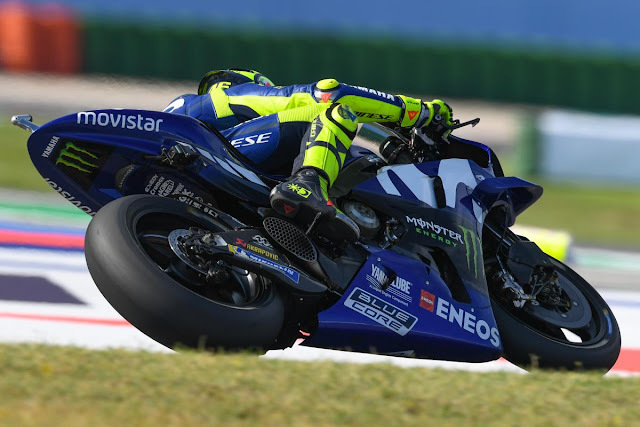 It's also one of my favourite tracks because of its lay-out, so in Aragon we can be very fast,” explained the number 25, who also points to the test Yamaha completed a few weeks ago as a sign that the M1 can go well this weekend. After a promising Friday and Saturday in Misano, can either Yamaha riders turn their Sunday fortunes around?